On 10 June 2014 I wrote my first post on this blog about the eBay data breach, which was published on 21 May 2014. This Thursday, nearly a year later, the Internal Revenue Service (IRS) data breach was made public. Cyber attackers used personal information mined from other attacks, even perhaps from the eBay attack, to breach the “Get Transcript” accounts of more than 100,000 taxpayers. Well said, those identity verification questions are really annoying. And inherently unsafe, as we learned from a Google study published this week. And yet the obvious solution would be to discard all those questions and to use Two Factor Authorization instead. 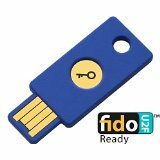 For example a FIDO U2F security key in combination with a one-time PIN or fingerprint would be a nearly unbreakable and cheap solution. How many data breaches must still take place before organizations seriously start securing their customers personal data? This entry was posted in New Technology, Opinion, Survival tips and tagged Cyber Attack, cyber security, data breach, eBay, Identity Verification Questions, Internal Revenue Service, IRS, Jose Pagliery, Personal data, personal identity verification, personal information, Two factor Authentication on May 30, 2015 by Klaus Jochem. Hi Jacek, what do you mean? I think my site was compromised. I have not sent this comment.